Think you need an English degree to make money proofreading? Think again. The essential skills you need as a proofreader aren’t ones that can be acquired from years at school. The truth is you don’t need a degree to be a proofreader. I’m going to reveal why you don’t need a degree or diploma, as well as what qualities and skills you truly need to succeed as a proofreader. The truth is, you don’t need a special certificate or diploma in proofreading to apply for jobs or start working as a proofreader. Heck, you don’t even need a degree to work in publishing anymore. I don’t have an English degree and I’ve been a successful proofreader for over 15 years. In university I studied media and communications, after which I attended a post-graduate program in book and magazine publishing. Over the years I’ve supplemented my editing knowledge through courses, books and online resources. I’ve also learned a lot from working with other editors who’ve been very generous with their knowledge. It’s important to always be learning. Many of my proofreading and editing friends come from various backgrounds and most of them don’t have English degrees, either. They have degrees, diplomas and certificates in history, anthropology, film, philosophy and marketing, to name a few. Studying in a post-secondary capacity gives you more exposure to different levels of language use, and forces you to learn how to write, but you can definitely pursue a career as a proofreader with a high school diploma as your foundation. You would just have to take classes to develop your skills. Below, I outline the “must haves” that every proofreader should have. These skills are essential in propelling you forward and can determine if you can make it as a proofreader. While you don’t need an English degree to become a proofreader, you must have a great command of the English language. This means you can recognize bad grammar, and can correct basic spelling and punctuation mistakes off the top of your head. If you want to see how your skills rate try our proofreading test that’s based on common mistakes found in a lot of content. You may think this is a no-brainer, but you have to seriously love reading because, obviously, you read. A lot. 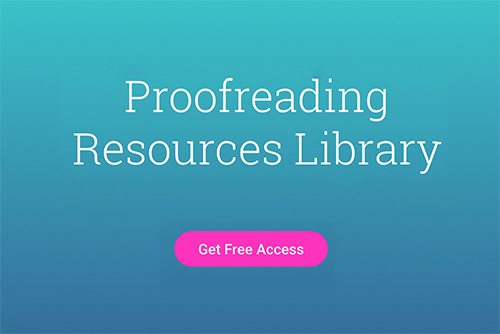 Proofreading involves a lot of reading and rereading of material because you want to make sure you catch everything. Have you ever started reading a book and stopped at some point because you just couldn’t get into it? That’s what proofreading can be like sometimes, except you can’t put the book/project down and walk away. I’ll be honest, some jobs can be engaging and interesting, while other stuff can be dry and painfully boring. This is when your ingrained respect for words will kick in and rescue you. In fact, you can sign up for my free intro course, Proofreading 101, to see if proofreading is for you. No degree in the world is going to teach you how to notice the details. Your talent for noticing the small and inconsistent things is going to be your biggest tool as a proofreader. While you can rely on checklists, it’s also possible to develop a fine eye for detail with a lot of practice. The ability to notice the small things will help you catch issues with confusables (words that get easily confused, like “affect” and “effect”), formatting, graphics and consistency. Why is self-control important for a proofreader? Because we MUST preserve the writer’s voice and respect their style preferences. It’s tempting to just delete all those unnecessary commas, but if a writer insists on sprinkling commas around like glitter (yes, I’ve seen this many times), then you have to step back. In one project I worked on the writer stated commas couldn’t be touched because of how he envisioned the reader reading his book. As wrong as that sounds, it was important for him to guide his readers’ experience, and there’s nothing you can do in that situation but respect that. Entrepreneurs and writers put a lot of sweat and tears into their work, so you can imagine how hard it is for them to hand over their “baby” to another person. If it’s an issue you really feel strongly about and can’t let go of, then approach it in a way that’s respectful. Time management is an essential skill in being a freelance proofreader. Working from home or from a sunny locale might make you the envy of your corporate-job friends, but watch out, it’s not all sleep-ins and playtime. A common mistake with new freelancers is they let loose and don’t follow a schedule. If you don’t get serious and dedicate a set amount of hours a day to your projects, then you’ll find yourself staring at a deadline that’s suddenly come too close, and you’re scrambling to meet it. You also have to be available to clients who are most likely working traditional work hours. And you also need to set aside time for marketing and managing your business. It goes without saying that if you want work then you have to go out and find it. You have to have the motivation and perseverance to market yourself in order to land your first couple of proofreading gigs. Marketing your services doesn’t include responding to job postings, it means making people aware of who you are and what you do. It involves researching prospective clients and industries, cold-calling and positioning yourself in a way that makes people feel they need you. It means making yourself visible online and within your niche if you have one. This is the hardest part of being a freelance proofreader (or any type of freelancer) and the most important thing to remember is that you can’t give up. Be creative, set goals, and if an approach doesn’t work then try a new way. Since most proofreading jobs are freelance, it’s necessary for you to have an understanding of business as a self-employed person. Freelancers have to manage tasks and projects, invoicing and accounting, and it can get overwhelming. There are a lot of apps and software tools available to help manage every aspect of running a freelance business. If you work as an in-house proofreader it’s still a good idea to learn some business skills if you ever choose to take on extra side projects. Everyone at some time has suffered from Imposter Syndrome, of feeling inadequate, of not really owning what we are doing, especially if it’s something new. I’ve been through it, and trust me, it slows you down if you don’t learn to overcome it. When I first started I doubted the corrections I made, second-guessed my research, I even worried I pointed out too many mistakes. Totally crazy, right? Part of this train of thought also included me berating myself for doubting my skills because I knew I was good at my job. In my heart, I trusted my abilities although I was swamped by fear. So how did I get over it? I came to realize that I was hired to do the work because my clients believed in me. They hired me because they trusted I was knowledgeable in an area they knew nothing about. All of the must-haves I’ve listed above are essential in establishing yourself as a proofreader. You don’t need formal education, but you do need commitment. To succeed you need more than language skills. You also need discipline, drive and good business sense. Treat proofreading as a business that you have to build. If you get a good grip on the marketing and business aspects then you’re more than halfway there. Don’t let yourself be intimidated or led into thinking you’re not good enough. Focus on yourself, your client and their content, and you’re gold. What’s your background, and do you think you have what it takes to be a proofreader? Let us know in the comments below! I am myself a proofreader with my own firm of proofreading and editing. I would say that I loved your article as I can personally vouch for some of the points you stated that how brutally they were correct. Thanks for putting such efforts to come with such a fantastic article. I’m glad you enjoyed the article, Min! Hi, l would like to know how I could do proofreading according to UK English standards and not American English standards. I’m just starting to think about proofreading. I have a Master’s degree in Biochemistry, but am currently a stay-at-home mom. I do not have an English degree, but I have worked as a writing tutor in college and am often asked to proofread by family and friends. Have I not picked Biochemistry, I think I would have went into translation: I have always loved languages. I am fluent in Russian and French as well as in English. Being an introvert, my greatest concern is the business and networking aspect of freelancing. I just signed up for your free course and hope to learn a lot in the next few days, to get me started. Thank you! Your background in languages is great, Tatiana! I’m an introvert, too, and what I like about proofreading is how we can keep to ourselves. Most networking and marketing is done online, anyways. I hope you enjoy the course, and if you haven’t already, check out the free workshop! Informative in one word. Just started your 5 day intro course and am liking it. Took the quiz and scored a 100% too. Any more quizzes? Good to know that my basics are intact. Hi! I found your site Friday and am so happy! I’ve been looking for something that I already do that I could use to create income. I absolutely love reading and English and learning and am very, very detail oriented. I have family and friends who seek me out to proofread their writing all the time. Seems like a “must do” for me. I love your encouragement to let go of the imposter syndrome as well as not letting myself be intimidated into thinking I’m not good enough. I’m so glad you’re in this space! I found your site through Pinterest, and love it! The quizzes are cool. I signed up for the free workshop but didn’t get a date? When do you think it’ll be? Hi Jenn, thanks for asking. I’ll be announcing the workshop date in a couple days so keep an eye on your inbox! Thank you so much for the useful information! I’m actually an engineer but I’ve always loved writing and I think proofreading can be a great way to help me reach my dream of becoming a professional writer. I just took the proofreading quiz and got all questions correct! This is great! I’ve always thought I’d be good at proofreading because I seem to zero in on mistakes whenever I’m reading something. I majored in Graphic Design in school, but I minored in English just because I love reading so much and felt like I needed something to fulfill that love. Lately I’ve been lost and at odds with my “day job”. I think exploring proofreading is an option I’m ready to explore! Proofreading is very satisfying for those of us who love books—you can even focus on just that area if you wish! Thanks for your post. It provided proof for my belief that proofreading is the right path for me. The quiz showed the areas I need to improve. I appreciate your offer of the 5 day course. I will complete it and go on from there. Thanks again.